As we’re well entrenched in the rainy winter weather that we’ve all come to know and love in the Lower Mainland, I thought I’d try and remind everyone of some winter driving issues. With the untimely passing of Surrey RCMP’s Cst. Adrian Oliver and the recent memorial service I was asked by someone not related to the law enforcement field why the memorial service was such a significant event. This person meant no disrespect at all and it is a good question for those with no relation to the profession. I started to wonder how best to explain it. I attended the funeral having only ever possibly met Cst. Oliver in passing. 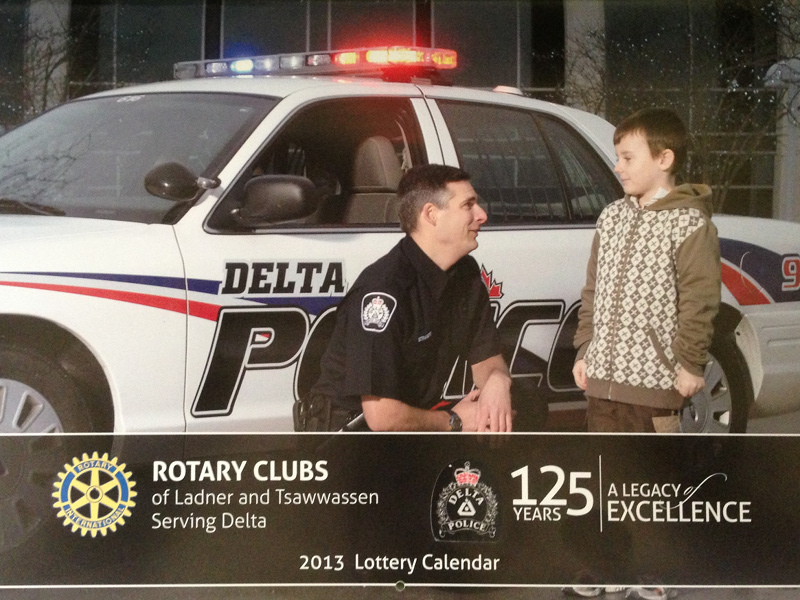 I thought I’d try to generate some dialogue on the blog and get our new Facebook page some “Likes” with a 2013 Delta Police & Rotary Club Lottery Calendar Giveaway. As I mentioned in the previous Broken hearts post I was just on a course at the Justice Institute to become a Qualified Technician on the instrument we use to collect evidentiary breath sample in criminal impaired driving cases. It was a great course with great instructors and classmates, the majority of the course were fellow members from Delta and a member from another department that I went to the academy with.